It's been awhile since I've added or updated any of the tutorials on Atlas Quest, and one I've wanted to add for quite some time now is how to transfer an image to a carving block with parchment paper. I can't tell you how many times we've tried to accomplish this and failed 100% of the time. We are so frustrated it's incredible. The parchment paper we use comes in a roll from the baking supplies aisle at the grocery store and is semi-opaque, white-ish. We've never seen the 'paper bag-colored' type you have used. (Where do you get it/what brand is it?). We have an Hp Office Jet Pro 8600 and it's an Ink Jet. Putting the paper through the copier is not our problem. We've never gotten the 'wet ink' scenario at all no matter what side of the parchment we use. It either blotchy, wet dots rather than a crisp line image or absorbed into the paper like a regular print-out. The "paper bag-colored" parchment paper I used is just regular parchment paper that's environmentally friendly. It's unbleached. "No chlorine is used in the making of our paper products, therefore no harmful byproducts are released into our environment." My printouts are blotchy, wet dots as well--that's normal. (At least for me it is!) You can't see it very well in my images since you have to zoom in *really* close to see the individual dots, but they are there. But do change your printer settings to print in the draft mode if it's too blotchy. You only need a little bit of ink. If you try to print at a "high quality," it'll likely use too much ink and the blotching will be a much bigger problem! Californiabluefrog has offered to give us some of her old, erasable typing paper to try as she has had luck with it. We'll report our results. I had the same issues - never could get a consistent process that worked all the time. 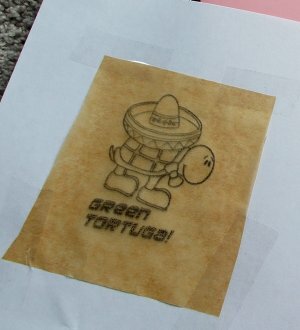 I finally gave up and bought a cheap laser printer. I suspect some ink jet printers just won't work well.